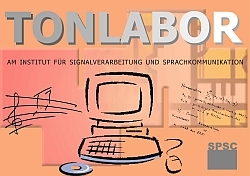 The Signal Processing and Speech Communication Laboratory offers together with the Information Technology Services (Zentraler Informatikdienst, ZID) the Sound Lab, a computer room in the basement of Inffeldgasse 12 (after basement stairs a bit to the left, room HFK1028). Nine PC workstations equipped with a wide range of applications, an audio mixer and headphones are available for students of Electrical Engineering and Sound Engineering. Feel free to check the equipment page for a detailed list of available hardware and software. A Scanner and a black-and-white laser printer in the network are available. Use is free of charge! If you are interested you may get access to the Sound Lab for labwork, soundengineers projects, your diploma or master thesis etc. Send your e-mail request including the kind of usage and the period of usage to Jamilla Balint). Since July 2011 our Sound Lab is equipped with an electronic door lock. Therefore you have to confirm that you are familiar with the handling of the electronic locking system and that you will stick to the Sound Labs usage policy. We suggest checking the online calendar as sometimes laboratories and lectures take place in the Sound Lab. Check the administration subpage for known issues and information on bug reports.